Acting President Liz W. called the meeting to order. District Assembly #2 is in Oxnard on April 13. All members welcome. The dental clinic is April 19 at the Neighborhood Clinic. Contact Susan with questions. Rotarians at Work Day returns April 27 at Elings Park picnic area. Drainage and path work and weeding. The Group 8 Zoo Day is Friday, May 3, starting at 4 PM. It replaces our May 1 meeting.Bring your family, a special friend and potential Rotarians. The Golf Tournament, one of our two major fundraisers, will be May 20. Distribute new brochures. We need auction items and golfers. Contact Steve K. with questions. Peace Scholar applications still being accepted. Six universities participating. 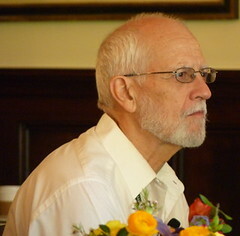 Applications due May 6 to Janet N. They can be found on the RI website. Give Joanne program ideas for next year. The RI Convention is still late June in Lisbon, Portugal. The Rotary Club of Carpinteria Morning hosts its Casino Night on April 20 from 6-10 PM at 700 Linden. Tecate fundraiser. Tickets available for April 20 event. Westlake 5k/10k run for global clean water on April 14. The Rotary Club of Ventura East celebrates 50 years on May 23 at the Pointsettia Pavillion in Ventura from 6-9 PM. 1960s theme. Board members, get your club awards info to Julie. Rendezvous will be Thursday at Sandbar 514 State Street. If you want to help with the step down for our president, contact Joe W.
Program: Elizabeth Schwyzer presents the Group Study Exchange’s trip to Sri Lanka. Elizabeth is a writer, teacher and dancer. The team was in Sri Lanka for one month. Sri Lanka is an island south of India and about the same size as our Rotary district. 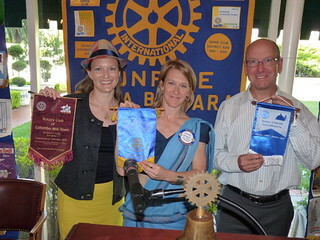 They spent most of the time in Colombo, where many of the Rotary clubs are based. The team was Pat McCollum, Levi Palencia, Dr. Brandon Todd and Greg Woodburn. The heat and humidity were relentless. That was one of many things they had to adjust to. They attended the District Conference, along with our District Governor Frank Ortiz. The team members made vocational visits to exchange information with people who practice their same craft. For example, she visited the Sunday Times. She spoke with journalists, dancers and martial artists. They visited an Indian elephant orphanage. They saw a lot of domestic and wild animals, including monkeys in the cities. Manacare village was home to one of many service projects the team visited. At the Center for the Handicapped, they saw production of prosthetic limbs. Limbs are needed because of the past civil war and traffic accidents. 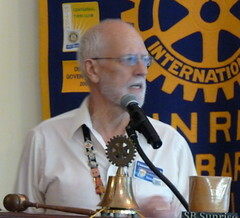 Rotary is a primary supporter and founder of these projects. Rotary also supports The Foundation of Goodness, which was founded after the 2004 tsunami. It includes a mental health clinic, training centers for trades, education facilities. Elizabeth’s favorite part was meeting people,staying in their homes and eating and talking with them. 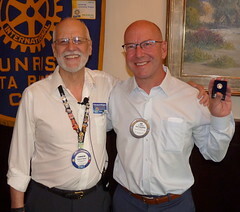 The team attended many Rotary meetings. Out of 31 days in he country, they probably gave about 20 presentations. It was a very demanding schedule. They met the first lady of Sri Lanka, the U.S. ambassador to Sri Lanka, the mayor of Nuwara Eliya (who is very interested in sister cities). Liz thanked the speaker, telling her 15 dictionaries will be donated to third graders in her name. Thanks to the people who served the club for the meeting.